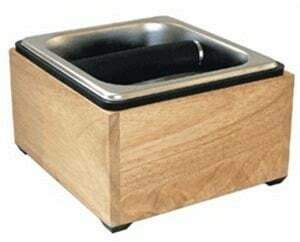 The Rattleware Maple Hardwood Knockbox with Stainless Insert is a beautiful hardwood knockbox with a heavy-gauge stainless-steel insert and an edge bumper. Rattleware's knockbox features a heavy knock bar with a replaceable cover and non-scratch rubber feet. Classic - With a classic, modern look you'll be knocking out your espresso pucks in style. Scratch Free - Rubber feet prevent you from scratching up you kitchen counters. Not Treated - The wood may be classy but it's not exactly treated, so you'll find water and coffee grounds may stain in over time. Has more of a classic look and feel compared to generic knock boxes due to the modern wood box casing.